Like people, pets need proper dental care to maintain a satisfactory state of health. Insufficient pet dental care can lead to bacterial build-up, tooth decay and oral diseases that can cause a lot of pain and inhibit a pet's ability to eat a normal diet. Here at Birdneck Animal Hospital in Virginia Beach, we believe that pets deserve exceptional treatment in all areas of health to have a happy, healthy and full life. One of the aspects of health that owners can often overlook is oral health. The veterinarians at our clinic can help keep a pet's whole mouth clean and healthy by performing regular cleaning services, applying treatment medications and thoroughly examining the mouth for any budding problems. Although our veterinary hospital can dramatically improve the dental health of a pet, perfect oral health for a pet also requires continuous care by the pet owner. Birdneck Animal Hospital has years of experience working with pets and owners to achieve excellent oral health. However, our veterinary hospital believes that good oral health starts in the home. Pets like dogs and cats should have their teeth brushed regularly. Brushing reduces plaque and bacteria build-up in the mouth. 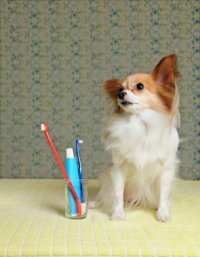 Brushing a pet's teeth is similar to the technique used to brush human teeth. However, the tools used are a bit different. For example, owners should never use human toothpaste when brushing a pet's teeth because this can make them sick. Most major pet stores will sell dog or cat toothpaste that you can purchase specifically for this task. You can also buy a pet-specific tooth brush and other oral health tools at our hospital. 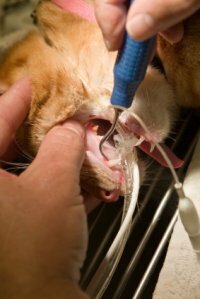 The professionals at our veterinary clinic can help advise pet owners about what techniques they can use to improve the oral health of their pets. In addition to regular tooth brushing, dental check-ups at our veterinary hospital are important to ensure that a pet is receiving proper care, and there are no serious problems. A veterinarian at our animal clinic will do a thorough examination of a pet's mouth to ensure that everything is healthy. This thorough examination may be supplemented with special diagnostic tools such as x-rays th at allow the veterinarian to examine fully the mouth for abnormalities or problems. If an x-ray shows that the tooth is loose or infected, our veterinary hospital may schedule surgery to extract it. Removing an infected tooth involves surgery, but prevents the spread of diseases and will help to eliminate any pain. Even if there are no major problems with a pet's oral health, seeing a veterinarian in Virginia Beach can ensure that a pet's mouth is healthy. A professional at our animal clinic can provide an extensive cleaning of the pet's mouth that includes scaling that incorporates special tools to remove plaque. The specialists at our veterinary clinic may also add fluoride treatments to improve health and reduce sensitivity. Our animal clinic also commonly applies tools that polish the teeth to remove scratches from the tooth enamel. If extra oral medicine is needed for a pet, the professionals at our veterinary clinic may also apply these and advise owners to use them at home. Oral health is just part of the battle when it comes to pet health. At our animal clinic, we provide health services for all aspects of pet health. If you have questions about pet oral health or would like to schedule a pet dental cleaning, please email us or call us at 757-355-5694.